A friendly and dignifying shopping experience. We know that each guest has a unique story and situation. Come visit us, and together we’ll figure out exactly what is needed for you and your family. It is our desire and our goal to meet your needs and to share with you the care, hope, and love of Christ through that service. Everyone who has a need for food is welcome to use our pantry. You are welcome to visit our pantry twice a month (every other week). Thursdays 9:00 AM – 11:00 AM & 5:00 PM – 7:00 PM*. *During our Thursday evening hours from 5:00 PM – 7:00 PM, we also serve dinner. 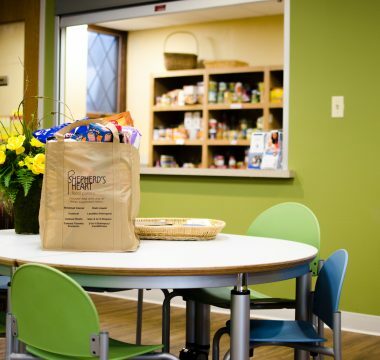 Our food pantry serves over 800 people per month, and your donations are key in keeping up with the need. Please feel free to drop off your donations in the bins provided for you.